Leftover waffles can be frozen and popped into the toaster to reheat. The syrup will keep, covered and refrigerated, for up to a week. First make the syrup. In a saucepan, combine the blueberries, water (if using), lemon juice and zest, honey, 1 tablespoon molasses and cloves. Bring to a boil over medium-high heat, then reduce the heat to low, cover and simmer until the berries burst and the juices are slightly thickened, about 5 minutes. Frozen berries may take slightly longer to thicken. Set aside and keep warm. In a small bowl, sift together the flours, cornmeal, baking powder, salt, cinnamon and ginger. In a large bowl, whisk together the soy milk, mashed sweet potato (or pumpkin puree), olive oil and molasses. Add the flour mixture and stir just until combined. Using an electric mixer on high speed, beat the egg white until stiff peaks form. For maximum volume, make sure that the mixing bowl and beaters are spotlessly clean and free of fat. Gently whisk 1/3 of the egg white into the batter to lighten it. Using a rubber spatula, gently fold the remaining egg white into the batter until just incorporated. Place a baking sheet in the oven and heat to 225 F. Heat a waffle iron. Spoon or ladle about 1/2 cup batter into the waffle iron. Spread evenly and cook according to the manufacturer’s instructions. Transfer the waffle to the baking sheet in the oven to keep warm. Repeat with the remaining batter. 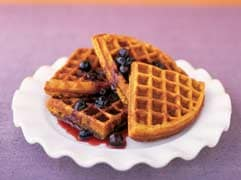 Serve waffles with the blueberry syrup. This recipe is one of 150 recipes collected in “The New Mayo Clinic Cookbook,” published by Mayo Clinic Health Information and Oxmoor House, and winner of a James Beard award.